Corsica on Friday night, the Nigeria Football Federation has announced. With the absence of substantive skipper Obi Mikel, Echiejile is the most experienced player in the squad, having made his Super Eagles debut eight years ago. The press conference was also attended by Corsica national team coach, Jean Michel Cavalli and goalkeeper Nicolas Pennteau. 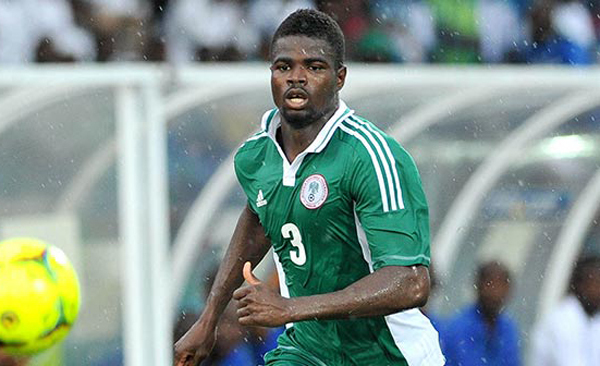 Super Eagles and AS Monaco wing-back Elderson Echiejile has said the Super Eagles will not underrate the Corsica Senior National Team when both sides lock horns today evening at the Stade Francois Coty, Ajaccio. The Super Eagles play the tiny island of Corsica in a warm up game ahead of the 2019 Africa Cup of Nations qualifier against South Africa’s Bafana Bafana on the 10th of June, and despite Corsica’s non- affiliation with either UEFA or FIFA, Echiejile says they expect some kind of challenge from the team. camp in Ajaccio boasts a number of young, ambitious fresh legs called up to jostle for positions in the team. The former Sporting Braga FC defender believes healthy competition for first team places in the team is a welcome development. The Eagles tackle Corsica Senior Team today at the Stade Francois Coty, Ajaccio starting from 8pm. The Corsica Federation, Ligue Corse de Football, have offered free tickets to children up to twelve years old living in the Island to watch Friday’s friendly between Corsica and Nigeria. The Squadra Corsa association presided by Dédé Discala says he wants to give an opportunity to the children and their companion to see the big names on the Nigerian team, including Manchester City’s Kelechi Iheanacho and Leicester City striker Ahmed Musa. ”We want them to share this moment and that it remains a beautiful memory for them,” Dédé Discala was quoted as saying by Corse Matin. “Around the flags of Corsica and Nigeria, it seemed interesting to us to send the message of a welcoming island with children, social categories and very different origins. The children will welcome the two national teams to the pitch before joining the spectators to watch the game, which begins at 2000 hours.